LockScreen+ lets you to personalize your lock screen with beautiful custom wallpapers. Create beautiful, pixel perfect parallax wallpapers for your iPhone or iPod Touch. 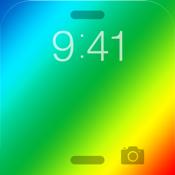 Easily create HD lock screens that will match the color of your iPhone or iPod case. Create unlimited personalized lock screens for yourself or your friends.